Hidden beneath the towering waves of the tax transformation tsunami commonly referred to as the “Tax Cuts and Jobs Act” of 2017; lies a somewhat over-shadowed verse which may presently fail to excite many appetites. The seemingly shallow amendment applies to the very first code section. Code §1 refers to the imposition of tax. It details tax rates, income thresholds and phase-outs, all subject to inflationary adjustments. The Tax Cuts and Jobs Act amends §1, specifically changing the inflationary adjustment calculation from utilizing the traditional “CPI index” to a “Chained-CPI index” (noted as C-CPI-U, or C-CPI). The CPI measures overall inflation as calculated by the Bureau of Labor Statistics. In addition to the traditional measures of the CPI, that agency computes another measure of inflation— the Chained CPI—designed to account for changes in spending patterns and to eliminate several types of statistical biases that exist in the traditional CPI measures. The Chained CPI has grown an average of about one-fifth to one-quarter percentage points more slowly per year over the past decade than the traditional CPI measures have. Suppose in the course of a year an individual spends $312 on snacks, purchasing 52 chocolate candy bars at a cost of $2 per bar and 52 bags of potato chips at a cost of $4 per bag. Further assume the price of a chocolate bar increases 25 percent to $2.50 per bar, and the price of potato chips increase by 5 percent to $4.20 per bag. [(52 x $2.50) + (52 x $4.20)] / [(52 x $2) + (52 x $4)] = 1.1167. [(52 x $2.25) + (52 x $4.00)] / [(52 x $2) + (52 x $4)] = 1.0417. 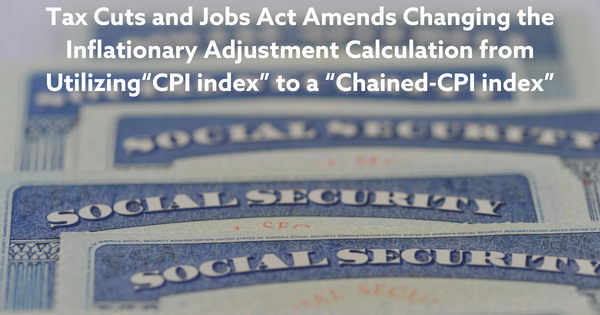 Not constrained to Code §1, conforming “Chained CPI” amendments were made to nearly 50 other code sections, covering the gambit of most future inflationary tax related adjustments. As time presses forward, these seemingly innocent small inflation reductions will add a few tax dollars here, reduce a few tax benefits there, and cumulatively amount to more than one presently cares to worry about. Remember, with 50 code sections affected, this change will eventually add more than small nibbles to a tax calculation. An early indication of how the Chained CPI index will affect tax thresholds is found in a March 2018 Rev. Proc. In reference to the Estate Tax Exclusion, early CPI based estimates calculated a 2018 amount of $11.2 million. However, Rev. Proc. 2018-18, in utilizing the newly required Chained CPI index has reduced the 2018 basic exclusion amount to $11.18 million for determining the amount of the unified credit against estate tax. Although the inflationary calculation may presently seem tastefully lackluster, the near future may hold a far more portentous argument. The Social Security COLA adjustment HAS NOT been placed under the Chained CPI index – a discernible question would be – Will it? Social Security cost-of-living adjustments (COLAs) are based upon a different Bureau of Labor Statistics index, the Consumer Price Index for Urban Wage Earners and Clerical Workers, known as the CPI-W. The CPI-W calculation includes only expenditures by those in hourly wage earning or clerical jobs. A COLA increases a person’s Social Security retirement benefit by approximately the product of the COLA and the benefit amount. The exact computation, however, is more complex due to early or delayed retirement effects on the benefit amount. The COLA effective for December 2018 will be based on the increase in the third-quarter average CPI-W for 2018 over the average CPI-W for the last base quarter. Therefore, the Chained CPI option would reduce federal spending at the detriment of retirees, and federal savings would significantly grow each year as the effects of the change compound. The CPI changes within the Tax Cuts and Jobs Act have been considered by some the garnish on a side dish. Such treatment is pardonable. However, Chained CPI attached to the Social Security COLA will cause an immediate “fly in my soup response,” something along the lines of – “Don’t you dare fool with MY Social Security!” In reality, that last quote may include a few more colorful words. For Social Security concerns during election years, politicians seem to apply the first date rule – of not talking about one’s last date. That is, they generally say nothing regarding Social Security changes, especially if those changes would decrease future benefits. But next year may be fair game. One cannot help but notice that the change to the Chained CPI index includes phraseology such as “….it’s rate of increase grows more slowly” rather than mention words such as “cuts” or “reductions.” As The Social Security Annual Report drips red ink, could Congress place the Chained CPI index applied to the COLA on a future menu?